These two chollas are very similar in appearance and are sometimes difficult to differentiate. Both have many thin branches that arise from the ground or a central stalk and grow to a height of 8-10 feet. They prefer sandy soils and grow at elevations from 1000 to 4000 feet. The Staghorn has a broad range and can be found throughout the Sonoran and Mohave Deserts. The Buckhorn's range is restricted to southern Arizona and northern Mexico. 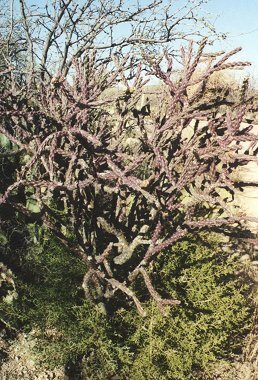 Though similar in appearance, the Staghorn Cholla (below) tends to have more of a purple tint than the Buckhorn Cholla (at right). The chollas bloom in April or May and produce bright flowers to 2 1/4 inches wide that range in color from red, yellow, orange, pink, & purple to greenish or brownish. After flowering, the plants produce fruit. 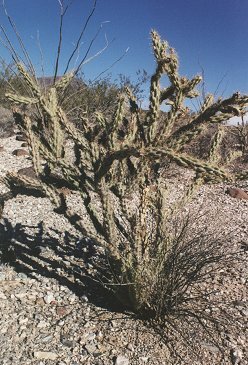 The fruit of the Buckhorn Cholla tends to be dry with long spines. The fruit falls from the plant after a few months. The fruit of the Staghorn Cholla is fleshy and spineless and remains attached to the plant throughout the winter. Native Americans used the fruits and buds of these cacti for food.